Third and Delaware is a site devoted to the classic sitcom, Roseanne. Fun for the fans. 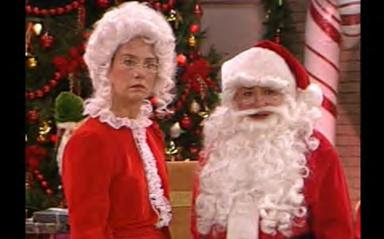 Through some mix-up at the Rodbells human resources department Roseanne and Jackie have been hired on as Mr. and Mrs. Santa Claus. Admittedly, they do both have the proper body shape to fill their respective roles, but one has to wonder about the implications of hiring such a tumultuous twosome to fill the roles of the North Pole’s happiest couple. Roseanne and Jackie can barely be in the same county without striking up an argument, what makes them think they will be able to spread holiday cheer in the long lead up to Christmas? If one more kid pulls at Roseanne’s polyester soup saver, she’s going to flip her lid. Read more at Third and Delaware.